My edition: Paperback, published on 5th June 2014 by Picador, 293 pages. Description: For the Posts, a two-week trip to the Balearic island of Mallorca with their extended family and friends is a celebration: Franny and Jim are observing their thirty-fifth wedding anniversary, and their daughter, Sylvia, has graduated from high school. The sunlit island, its mountains and beaches, its tapas and tennis courts, also promise an escape from the tensions simmering at home in Manhattan. But all does not go according to plan: over the course of the vacation, secrets come to light, old and new humiliations are experienced, childhood rivalries resurface, and ancient wounds are exacerbated. Family holidays can be a source of happiness but also of frustration and tension, as Franny and Jim find out when they take their two grown-up children to the exotic island of Majorca. They rarely see their eldest, Bobby, after since he moved to Florida, and their daughter Sylvia is about to leave the nest too, so this holiday symbolises the final moments of the Post family as they've known it for decades - and one which Franny in particular needs to be perfect as her marriage is crumbling in front of her eyes. As if that isn't enough pressure already on what is ultimately no more than a few weeks cooped up in the same house in Europe, there are a few more people joining them on the trip. There is Bobby's long-term girlfriend Carmen, who is over ten years his senior and because of this has never been able to fit in with the Posts, and Franny's best friend Charles and his husband Lawrence, who are in the middle of a nervous-wrecking attempt to adopt a baby. The complicated family dynamics that slowly unraveled on the holiday provided some compelling elements that kept me wanting to read further, but ultimately the story was too bland and unremarkable, so even a few days after turning the final page I'm struggling to remember what happened. I also found the characters for the most part uninteresting, even bordering on the unlikeable, and their individual journeys left me indifferent. Of course I enjoyed reading about some of the eligible local men on a superficial level, but Carmen's story was the only one which I gradually started to feel moved by. However, as she was mostly seen through the judgmental eyes of the Posts it was difficult to view her objectively and as her own person, rather than as an unwanted extension of Bobby. The exotic setting of Majorca was new to me and as soon as I opened the novel I was anticipating a wealth of colour and foreign flavours, but the location descriptions were too sporadic and generic to conjure up vivid images of crisp, white beaches or the spicy taste of the local food. The writing was insipid, lacking the colour and detail that would've been able to transport me from a dreary British spring day to the heat and excitement of a tropical island. 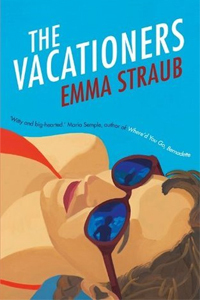 Filled with sunshine, seaside outings and slowly uncovered secrets, The Vacationers had all the ingredients for a sizzling summer read, but with a bland story and lack of joie de vivre it failed to deliver in the end.